Members and guests of the Bay Area Travel Writers gathered on an October morning at a black-walled San Carlos jazz club for a special opportunity: They were there to see four successful writers spread some light and sound on some of the latest and most useful techniques of today’s dynamic social media. 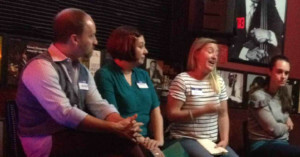 The benefits of tweeting, using Instagram and similar methods benefitting travel writers were lauded by the panel, all of whom are headquartered in the San Francisco Bay Area. The quartet were seated on high chairs before a receptive audience hosted by the Savanna Jazz Club. Novelist and podcast producer Matt Felix discussed lessons learned from a relatively late start in social media. He touched on the importance of choosing platforms aligned with the needs and objectives of the writer’s audience and how podcasting has proven an effective platform for him: “Writers should experiment since what works best for one writer might not produce the best results for another,” he said. Carrie Swing, who consults on media marketing and teaches Instagram classes, distributed a worksheet with more than a dozen hints and techniques for writers seeking an audience for their works: “I’ve been a blogger since 2010 and an early adopter —I call it guinea pig—of many social media channels,” she said. Anne Lowrey, who has traveled to about 50 countries, said writers should present an online presence that accurately represents them: “Don’t worry about your number of followers. Focus on quality. Think of social media as a conversation. Promote your work, but also engage with others’ content, ask questions, and share helpful tips,” she said. Other Peninsula area guests who spoke at the meeting included Paul Rogerville and Chris Garrett representing wineries and beer brewing interests throughout San Carlos and Pacifica. The award-winning street-front Savanna Jazz Club at 1189 Laurel St. in San Carlos is well known to be committed to the revitalization of jazz through lectures, seminars, music contests, and clinics. Following the meeting, several attendees took lunch at the Town restaurant near the jazz club. Arrangements for this terrific meeting were made by BATW member Mary Jean (“MJ”) Pramik.